Stir the tomato juice together with the pickle juice, clam juice and lemon juice in a small pitcher. Add the Worcestershire, horseradish, hot sauce and coffee crystals and stir until the coffee dissolves. Refrigerate for 1 hour before serving. Pour the vodka into 4 highball glasses filled with ice fill the remainder with the tomato mixture. Top with celery bitters just before serving. Celery bitters are available at better liquor stores and, of course, on the interwebs. For those who like gazpacho, take the gazpacho ingredients and soak them overnight in Clamato. Strain the juice and use for the Mary. The oils from the vegetables extract from the tomato acid. Then make the gazpacho. Also, never forget the Pickapeppa. Up North in Leland, they make a Chubby Mary with a whole smoked chub in it. They also make their own horseradish infused vodka. MMMmmmmm. I don’t see a quantity for the coffee crystals. Any recommended brand? Tutu Helper App is not just App Store, however you could also manage you pre-existing apps and video games like upgrading and also uninstalling them. 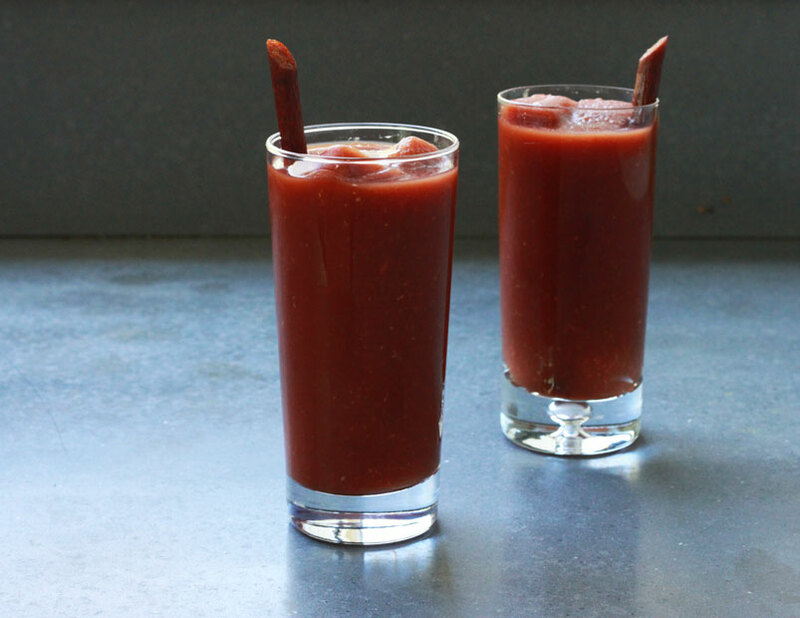 Tim Priddy is correct: bacon-infused vodka makes a totally kick arse bloody mary. Other versions became lackluster imposters once I had a bacon mary. I like my Bloody Mary hot and spicy and have found “Five Peppers” Bloody Mary Mix to be the start of a great bloody. It also needs good vodka. Some friends find cheap is good enough, but Tito’s really gets down to business. So, a half glass filled with Tito’s, and half with “Five Peppers”. Then add the basics. More horseradish, salt, pepper, celery salt, an olive with at least a teaspoon full of olive juice, a kosher dill pickle with another teaspoon of pickle juice, lemon juice, a lemon slice, a lime slice and finally the stalk of celery. This will make friends clamor for more. We mix everything except the tomato juice and bitters in advance and store in fridge. Then we mix our bloody mary by the glass. Works great. Also, I personally enjoy celery salt on the rim of the glass. Very curious about the coffee. Sounds like a great Caesar, I must try this. I love the slim Jim idea. My friends would be horrified but it sounds perfect. What kind of pickle brine? Dill? Definitely a dill pickle juice! That’s what I assumed…but you never know! Pepperoncini juice is really good too! And red wine vinegar. Isn’t it a technically a Caesar if you use clam juice? I think I would just use the bottle of olive juice I bought for Dirty Martinis, instead of pickle juice, it’s delicious in bloody mary’s. I agree with the pickled okra garnish (from Charleston SC) I also like to rim the glass with a new product made locally, Bull’s Bay Red Mash Sea Salt. It’s a grinder with sea salt and chili peppers. I always squeeze a wedge of lime and lemon. I just started making the tomato infused vodka *today* to try Bloody Mary’s 1.0, now this? Bacon flavored vodka and garnish with a big old slice of baked thick cut hickory maple syrup bacon! YUM!! Yum! Much better than Bloody Mary 1.0. But every good southern boy knows the proper garnish is a pod of pickled okra. Clam juice in a Bloody Mary? In Canada we call that a Caesar (or Bloody Caesar). Adding coffee sounds like a stroke of genius though! I have a similar recipe. My pickle juice of choice is from the kosher dills in the refrigerated deli section.